The Emperor Augustus' so-called social or moral legislation features prominently in legal and historical discussions of his principate. His biographer Suetonius concentrates into one chapter a discussion of Augustus' leges rogatae, which has never been analysed phrase by phrase by any scholar of Roman history or law since Paul Jörs in 1893. This article sets out to explain how Suetonius orders his discussion, chooses precise vocabulary, highlights key stages in the legislative programme, and does not conceal opposition to the legislation. The most controversial law, on which Suetonius centres his discussion, is the lex Iulia de maritandis ordinibus, key provisions of which were amended in the lex Papia Poppaea of AD 9. I argue that Suetonius comments not only on the lex Iulia de maritandis ordinibus, but also on later amendments, whether in the putative lex Aelia Sentia of AD 4 or the indisputable lex Papia Poppaea. There is, however, no reference to any abortive moral legislation of 27 BC. Suetonius presents an emperor concerned with major social issues, careful in the formulation of his laws, but also suitably responsive to societal pressure. In the course of writing a detailed literary and historical commentary on Suetonius' Augustus that gives due attention to the biographer's compositional techniques while illuminating his thought and the structuring of his material, I had to pay careful attention to Augustus' short and deceptively simple chapter on legislation. This article sets out the problems of legal and historical interpretation of the biographer's words. It also proposes a possible solution to these problems, based on a broad understanding of how Suetonius assembled his material and a specific study of the moral legislation that interested him. A feature of both Suetonius' Lives and the Historia Augusta are sections that provide résumés of imperial legislation and illuminate the different authors' competence in dealing with an important aspect of the emperor's work.8 Richard Bauman has identified two kinds of résumé, which he calls respectively "diffuse" and "concise", Chapter 34 being an example of the latter.9 Appropriately in the Augustus, given that Augustus reigned at an early time in legislative development under the Principate, the emphasis is on leges rogatae rather than senatus consulta, edicta, decreta or rescripta.10Bauman conjectures that Suetonius had access to a comprehensive collection of Augustan legislation in the form of commentarii kept in the imperial library, of which Suetonius was putatively librarian before becoming Hadrian's ab epistulis.11However, this hardly fits in with the general pattern of Suetonius' reading, with its excerption of annalistic histories and use of contemporary sources whose names he parades before his readers.12 What kind of material the annalistic historians could provide on Augustus' legislation, and how they scattered it throughout their narrative, is best demonstrated by Dio. As often in Suetonius, the first word of the chapter, leges, signals to the reader a change of topic, here from imperial first- and second-instance jurisdiction to leges rogatae. When dealing with a period of dominance as long as that of Augustus, fifty-six years by Suetonius' calculation, he could discuss much legislation, comprising perhaps as many as two hundred laws.13 His opening phrase points to a clear differentiation between retractavit and ex integro sanxit.14The former category relates to laws covering subjects on which there had already been specific legislation: for example, there were several Republican leges de ambitu;15Sulla had initiated a lex sumptuaria, as had Caesar in 46 BC, and Sulla had probably sponsored a lex de adulteriis et de pudicitia, if Plutarch's mention of a law περι γάμων και σωφροσύνης16 is reliable. According to the jurist Paul, the lex Iulia de adulteriis began with an explicit abrogation of several earlier laws,17 which suggests that it could be seen as retractare, even if the control that Augustus sought to exercise, in an area that had lain mostly in the hands of patresfamiliae, was novel. The formulation quasdam ex integro sanxit indicates three things: i) these laws were not numerous, ii) they were laws on a novel subject matter, and iii) Augustus was their rogator.18 As far as we know, of all the laws passed during Augustus' reign, only a small proportion bore the emperor's nomen as leges Iuliae.19Each of the laws Suetonius lists by title does seem to be a lex Iulia, an interpretation shared by the Epitomator of Aurelius Victor, whose reworking of Suetonius reads leges alias novas alias correctas protulit suo nomine.20Whether only leges Iuliae are being discussed here is an issue of some importance for an understanding of the rest of Suetonius' passage; in particular whether any of the provisions that according to Suetonius were initiated by Augustus may stem from the lex Aelia Sentia or the lex Papia Poppaea, laws passed by the consuls of AD 4 and 9 respectively. In short, it is not possible to take a purist line on Suetonius' usual approach. For example, in his discussion on Augustus' actions concerning manumission, Suetonius attributes to Augustus the provisions of the leges Aelia Sentia and Fufia Caninia,21so we are not justified in restricting the contents of Chapter 34 to the leges Iuliae of 18/17 BC only. Back, however, to the introductory sentence: the ut that introduces his list of laws makes it plain that Suetonius is being selective. It seems that the list contains four laws, his et de adulteriis et de pudicitia being the full title of what is generally known as the lex Iulia de adulteriis coercendis.22 If this is the case, then only the fourth law, de maritandis ordinibus, is an example of Suetonius' second category.23All four laws can probably be dated to 18 and 17 BC: the leges de ambitu and de maritandis ordinibus are given that date by Dio;24 a possible allusion in Horace's Carmen saeculare dates the lex de adulteriis et pudicitia to before the middle of 17 BC,25 another allusion dates it at no later than 16 BC.26 It is generally held that the lex de adulteriis coercendis follows logically on from the lex de maritandis ordinibus,27so that too seems definitely to belong in 18 or 17 BC. The lex sumptuaria is the hardest to date, since we know little about its contents, but a weak case has been made out for 18 BC, on the assumption that Augustus' alleged advice to Livia on dress and adornments, extorted by an eager senate according to Dio, reflect an earlier enactment on the subject.28 The order in which the laws appear in Suetonius' list is probably not chronological,29 but determined by the distinction between retractare and ex integro sancire. Thus the first three laws belong to the first category and the lex Iulia de maritandis ordinibus to the second. It was Paul Jörs who in 1893 first analysed most of the chapter dealing with the lex Iulia de maritandis ordinibus. He with great intelligence combined the evidence of Augustan poets with the more obvious historiographical and legal texts.32 The influence of this work on more than one hundred years of classical scholarship has been traced minutely by Tullio Spagnuolo Vigorita.33 He shows that English-speaking scholars were hardly influenced at all by Jörs' proposed chronology and its effect on their research on the lex Iulia de maritandis ordinibus and the lex Papia Poppaea was minimal.34 This reluctance to interact with Jörs continues in the chapter by Susan Treggiari on Augustus' social legislation in the revised Cambridge Ancient History and in her important monograph on Roman marriage.35 Needless to say, none of the modern commentaries on Suetonius' Augustus enters into any debate with Jörs or recognises the consequences of his views for the study of Suetonius. Richard Bauman's brief discussion of Chapter 34 disagrees in every respect with Jörs and fails to mention him,36 while Michael Swan, whose commentary on Cassius Dio does engage fully with Jörs, denies that Suetonius makes any reference to Augustan marriage legislation of later than 18 BC. I shall attempt to present Jörs' arguments and evaluate them through a close examination of Suetonius and Dio, in the process clarifying Suetonius' references at each stage. The table that follows this article presents a synoptic view of the positions taken by Jörs, Bauman, Swan and myself on each element of Suetonius' argument. Augustus outlined a series of proposals that were then enshrined in the lex Papia Poppaea, introduced by the suffect consuls in the second half of the year: i) increased rewards for those who had produced children; ii) a distinction to be drawn between the penalties imposed on the married who were childless and those who were unmarried;43 iii) a further period of grace (vacatio) of one year for both groups before the provisions of the law came into effect; iv) the exoneration of women from the lex Voconia, which had restricted their rights to inherit and make wills; and v) the Vestal Virgins to be granted the privileges secured by women in terms of the ius trium liberorum. So Jörs' most important contribution is to have posited a law passed in AD 4 that increased the severity of the terms of the lex Iulia de maritandis ordinibus, so much so that Augustus was forced to make a series of concessions, which were incorporated in the lex Papia Poppaea. Because Dio's narrative for AD 4 is very abridged, there is no trace of the legislation in it, but every reference in Book 56 to earlier legislation is consistent with such a law. I propose to consider, through a phrase-by-phrase discussion of Suetonius' account, whether it is Jörs' or alternative approaches that make best use of the literary, legal and historiographical evidence available and how that affects our view of the biographer. 6 Does Suetonius refer to legislation before 18/17 BC? We have next to deal with hanc ... prae tumultu recusantium perferre non potuit nisi adempta demum lenitive partium poenarum ... . Bauman leaves open the possibility that the opposition expressed by Suetonius was to a piece of legislation known only from Propertius' elegies: gavisa est certe sublatam, Cynthia, legem / qua quondam edicta flemus uterque diu / ni nos divideret.55The date, nature and legal status of this measure have been the subject of prolonged debate: whether it belonged to the triumviral period or to the laws enacted by Augustus between 28 and 26 BC at the beginning of his principate proper; whether the measure was primarily financial or sought to regulate the right to marriage of free-born Romans, and whether the measure was a law that was fully enacted (lex), and then abrogated, or a bill that was merely promulgated (rogatio) but not passed. The key to the debate is the precise meaning of Propertius' lex and edicta: Badian, perhaps the most influential discussant of the passage in the English-speaking world, argued that Propertius was referring to a triumviral decision with the force of law that imposed financial penalties on the unmarried and that the expression lex sublata never refers to a withdrawn rogatio.56However, in non-legal texts the use of lex for rogatio is unexceptional and Caesar provides a pertinent example in which sublata priore lege means a bill withdrawn in the face of opposition.57 Although Augustus was prevented from passing this law, he succeeded in transferring some of the clauses of his intended legislation into other measures that were passed in 27 BC: for example, career priority for those who were married and had children was enshrined in the lex annalis and/or the lex de provinciis of 27 BC.58 Although the historicity of this earlier Augustan rogatio now seems beyond dispute, is this the rogatio that Suetonius refers to in perferre non potuit? If that identification is to be accepted, the events of c 27 BC and those of 18/17 BC must in effect be seen as a single piece of legislative activity spread over a long period. The only clue to the duration of the process is demum. Unfortunately, Suetonius' usage is so varied as to provide certainty only in respect ofthe chronological sequence of events discussed.59 Jörs himself takes demum to indicate a lengthy period, which he identifies as that between AD 4, when he believes Augustus enacted his severe law, and AD 9, when the lex Papia Poppaea was enacted. However, the only protest against the putative law of AD 4 that resulted in changes took place five years after the passing of the said law, which is not the sequence that Suetonius envisages. Moreover, perferre naturally means "carry [into law]" and Suetonius must be taken to mean that the measure was not "carried into law" in the form Augustus wanted.60The most likely time when a relatio was withdrawn is the period leading up to the enactment of the lex Iulia de maritandis ordinibus, the nineteen months between Augustus' return to Italy in October 19 BC and May 17 BC.61 This identification provides us with a context in which Augustus himself presented a rogatio, withdrew it in its original form, but persisted and passed a lex that bore his name (like the other laws explicitly mentioned by Suetonius), although it was not as severe as he had originally intended. 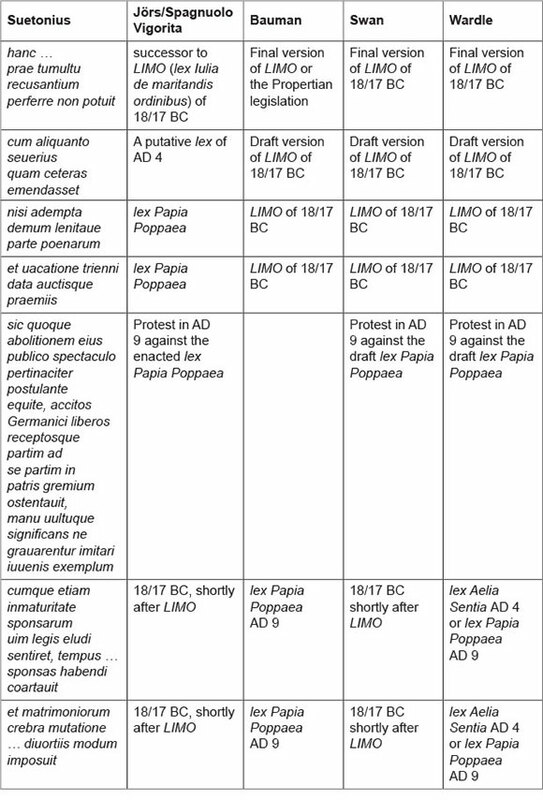 Nisi adempta demum lenitive partium poenarum et vacatione trienni data auctisque praemiis according to Jörs refers to the concessions that were incorporated into the lex Papia Poppaea, for the alternative view they were incorporated in the lex Iulia de maritandis ordinibus. In attempting to evaluate the differing arguments, we face two problems, firstly that Suetonius provides us with insufficient detail on the first and third concessions to enable us to know what he means, and secondly, the equally insurmountable problem that the legal sources providing the bulk of the detailed information on the lex Iulia de maritandis ordinibus (whether we take this as the law of 18 BC or that of AD 4) and the lex Papia Poppaea for the most part treat them as one law.62 Likewise, to determine what might have been in the draft version of the lex Iulia de maritandis ordinibus we would need to work backwards from the provisions of the enacted law. Key provisions involving restrictions and penalties in the laws were: i) unmarried men aged between twenty-five and sixty and unmarried women between twenty and fifty could not receive inheritances outside the sixth degree of their agnatic family; ii) a disbarred heir had one hundred days in which to acquire a spouse; iii) divorcees within the age limits had six months, and widows a year, in which to remarry under the lex Iulia de maritandis ordinibus and twice as long under the lex Papia Poppaea; and iv) one surviving child exempted a man from the limitations of the law, and three surviving children exempted a woman. In theory the provisions relating to any of these four topics may have been more severe in the previous version of the legislation required by each view, but it is only in respect of the third provision that we know this was so. The next issue is the major demonstration by the equites:73Do Suetonius and Dio describe different protests and what their likely context is? If, as Swan appears to argue correctly from the similarity of language (publico spectaculo = θέας έπινικίους; pertinaciterpostulante equite = οί ίππής πολλή ... σπουδή ... ήξίουν; abolitionem = καταλυθήναι), Suetonius and Dio refer to the same protest by the equites, this incident is linked by the clear chronological detail in Dio to the victory parades in honour of Tiberius' Pannonian success. This was celebrated in spring AD 9, before the passing of the lex Papia Poppaea at some time during the second half of the year when M Papius Mutilus and Q Poppaeus Secundus were suffect consuls. According to Jörs and Spagnuolo Vigorita, Suetonius had the equites protesting against the lex Papia Poppaea itself, even though it embodied concessions. Thus the biographer describes a later, different demonstration from the one referred to by Dio, who cannot be held to have dated his demonstration incorrectly.74 According to Spagnuolo Vigorita, the demonstration took place during the one-year vacatio granted after the passing of the lex Papia Poppaea in the first half of AD 10.75 Suetonius' testimony that Germanicus had many children suggests a date some time in AD 9.76 Thus Augustus would have been able to refer to Germanicus as a perfect example, since Germanicus' marriage to Agrippina probably took place in AD 4 or in AD 5 at the latest, and was splendidly fertile. Jörs' argument that Germanicus did not return to Rome in time for the spring games depends solely on Dio's statement that Germanicus announced the final Tiberian victory over Dalmatia in late summer or early autumn, just before news of the Varus disaster reached Rome, but his presence in Rome earlier in the year is not excluded.77 Suetonius' opening two words sic quoque may indicate where he believed the protests to have taken place. Swan argues convincingly that they must mean "despite this" or "even so", namely despite the concessions.78 If, according to Swan, the concessions were included in the lex Iulia de maritandis ordinibus of 18 BC, Suetonius' reference to a demonstration, which he knew occurred in AD 9, to illustrate opposition to it, involves his "overlooking] the chronological leap",79and thus the demonstration becomes chronologically separate from the material on both sides of it. In Swan's view, Suetonius' treatment of Augustan legislation on marriage stops in 18 BC, and the law that features most prominently in the literary and legal sources, the lex Papia Poppaea, is totally ignored. If, however, the final two parts of Suetonius' discussion refer to the lex Papia Poppaea (or the lex Aelia Sentia), then the equites' demonstration is not isolated in the context of the rest of the chapter: Augustus is portrayed as responding actively and logically to the abuse of his legislation and firmly ignoring protest. If this examination of Suetonius' treatment of a key element of Augustus' social legislation has accurately identified the stages and measures that the biographer discussed, then it appears that Suetonius did not focus only on the legislation of 18/17 BC, but, appropriately, demonstrated Augustus' concerns and activities up to AD 9, when the lex Papia Poppaea was passed. If this is so then Suetonius' understanding of the provisions of the latter as a tightening up of the lex Iulia resembles that of Tacitus, who in a famously cynical survey saw the lex Papia Poppaea as a pernicious law that gave free rein to delatores and plunged all into terror.90 The biographer, however, lets no shadow fall on Augustus - there are no comments on the continuing ineffectiveness of the marriage legislation. Rather he depicts the paradigmatic emperor as persisting in upholding traditional morality and above all the institution of marriage, although the weakness of others forced him to be less strict than he would have wished. Suetonius depicted Augustus as remaining resolute, citing examples of good moral conduct that could be followed and closing loopholes when he saw his own legislation being circumvented. 4 Other commentaries are either cursory (MA Levi C Suetoni Tranquilli. Divus Augustus (Florence, 1951) or antiquated in many details (ES Shuckburgh C Suetoni Tranquilli. [ Links ] Divus Augustus (Cambridge, 1896). [ Links ] The recent larger-scale work by N Louis Commentatire historique et traduction du Divus Augustus de Suétone (Brussels, 2010) has no detailed or up-to-date legal bibliography. 9 According to Bauman (n 8) at 84-86, Suetonius concentrates his references to leges in chapters 32 to 37, mostly treated in his "diffuse" way. Bauman conjectures (at 92-93) that the practice ofrésumé was known in the late Republic, although the lengthy ramblings of Dionysius of Halicarnassus on family law (2 24 7) are not a good model for Suetonius' practice; and the periocha of Livy Book 89, which postdates Suetonius, is no guide to the scale or treatment that Livy accorded Sulla's legislation. In practice, every annalistic historian who included legislation in his works will have had to précis and transform the legal material to meet the genre's requirements; the meagre fragments of the annalists do not permit us to say whether any writer from the Republic or Early Empire preceded Suetonius in treating legislation topically, rather than in its chronological place in his narrative. 10 Bauman (n 8) at 89-91. 11 For the best account of Suetonius' career, see GB Townend "The Hippo inscription and the career of Suetonius" (1961) 11 Historia 99-109. 12 See, eg, D Wardle An Historical Commentary on Suetonius' Life of Caligula (Brussels, 1994) esp at 62-63, and AF Wallace-Hadrill Suetonius (London, 1983) at 63-64, [ Links ] for the particular exuberance of Suetonius' citations in the Augustus, displaying the biographer's expertise on the late Republic and early Empire. 13 B Biondi Scritti Giuridici vol 2 (Milan, 1965) 83 = La legislazione di Augusto (Milan, 1939). Cf Tac Ann 3 25 2: multitudinem infinitam ac varietatem legum. 14 Cf Vell Pat 2 89 4: leges emendatae utiliter, latae salubriter, for a similar distinction in the legislative programme of 28/27. See AJ Woodman Velleius Paterculus. The Caesarian and Augustan Narrative (Cambridge, 1983) at 255-256, who accuses Suetonius of "confusing detail", but himself causes confusion by giving retractare the same meaning as emendare. Swan (n 5) at 369 nicely translates the two verbs as "rework" and "enact". 16 Comp Lys et Sull 3 3. 18 Sancire within the Life (cf 29 2, 35 3, 44 2) indicates a lex and points to Augustus' use of his tribunician power in the concilium plebis. However, Tacitus uses sancire of Augustus' role in introducing the leges Papia Poppaea (Ann 3 25 1: de moderanda Papia Poppaea, quam senior Augustus post Iulias rogationes ... sanxerat). In Res Gestae (8 5: legibus novi[s latis complura e]xempla maiorum exolescentia iam ex nost[ro usu reduxi) Augustus makes a noteworthy claim to novae leges (see H Bellen "Novas status, novae leges. Kaiser Augustus als Gesetzgeber" in G Binder (ed) Saeculum Augustum vol 1 (Darmstadt, 1987) esp at 308-309), which certainly includes all that Suetonius places in his second category, whatever conclusion we come to on the lex de adulteriis et pudicitia (see below). Cf eg, Sen Ben 6 32 1: pater legem de adulteriis tulerat; Justinian D 48 5 1: haec lex lata est a divo Augusto. The striking use of novae, for once non-pejorative, suggests that Augustus envisaged his legislation as an entity (see McGinn "Something old" (n 7) esp at 3-4). 19 It is impossible to be precise, given the difficulty of deciding whether to attribute particular leges Iuliae to Caesar or Augustus, but the eleven leges Iuliae of Augustus posited by G Rotondi Leges publicaepopuli Romani (Hildesheim, 1967) 439-462, form a reasonable core and the right order of magnitude. 21 Aug 40 4. This is a perfectly intelligible consequence of Suetonius' biographical focus and method and does not amount to error or slackness on his part. Were our knowledge of legislation under the empire more complete, further attributions of legislative actions to his subjects by Suetonius might be linked to specific procedures (fN 10 1, the abolition of vectigalia). 22 In the Codex Justiniani there are two references by Domna and Proculus to a lex Iulia de pudicitia in a constitution of Severus Alexander from AD 224 (C 9 9 8-9), but the provision they cite appears to have been part of the lex Iulia de adulteriis coercendis. The paired ets, which are the only connectives in the list of laws, suggest either that Suetonius is giving the full title of the lex Iulia de adulteriis et [de?] pudicitia or that et de pudicitia is a feeble gloss on de adulteriis, perhaps reflecting a late version of the title (see Carter (n 1) at 142), of which there are several (see P Csillag The Augustan Laws on Family Relations (Bucharest, 1976) at 223 n 72). The full title is more likely, since pudicitia was a major concern of the law (cf A Mette-Dittmann, Die Ehegesetze des Augustus. Eine Untersuchung im Rahmender Gesellschaftspolitik des Princeps (Stuttgart, 1991) at 71). The suggestion of Fitzler and Seeck (Real Encyclopadie X 354) that Suetonius is referring to one compendious law is unacceptable. REA Palmer "Roman shrines of female chastity from the caste struggle to the papacy of Innocent I" (1974) 4 Rivista di Storia Antica at 138-140 inferred a lex de pudicitia from Propertius' lex sublata (2 7 12), more plausibly related to a forerunner of the lex Iulia de maritandis ordinibus (see below), but there are no known parallels for such laws. 23 Swan's translation ((n 5) at 369) "he reworked the laws, enacting some afresh, for example ..." is misleading in that it subordinates sanxit rather than according it equal prominence with retractavit; for ex integro to provide the correct contrast with retractavit it must mean "from scratch", and Suetonius' examples are not all from the second group. 24 Dio 54 16 1-2. 25 57-58. See Treggiari (n 7) at 277-278. 26 Carm 4 5 21-24. 27 See, eg, P Girard "Les leges Iuliae iudiciorum publicorum etprivatorum" (1913) 34 Zeitschrift der Savigny-Stiftung für Rechtsgeschichte. Romanistische Abteilung at 306 n 1. 28 See S Riccobono Acta Divi Augusti (Rome, 1945) at 198. 29 Contra Csillag (n 22) at 220 n 55. 30 See, eg, 27 4, 69 1. 31 I leave only to those who like to resort to psychology, the idea that the biographer whose marriage had proved childless (Plin Ep 10 94 2) and had to receive from Trajan a special grant of ius trium liberorum (Plin Ep 10 95) enjoyed highlighting the difficulties encountered by Augustus in pursuing his matrimonial legislation. In Augustus (eg, 35 1 54) Suetonius frequently mentions the obstructions faced by Augustus. 32 P Jörs "Die Ehegeschichte des Augustus" in Festschrift für Theodor Mommsen zum fünfzig-jahrigen Doctorjübilaum (Marburg, 1893) re-issued with lengthy introduction by T Spagnuolo Vigorita Iuliae rogationes. Due studi sulla legislazione matrimoniale augustea (Milan, 1985), a collection which also includes Jörs' doctoral thesis Über das Verhaltnis der lex Iulia de maritandis ordinibus zur Lex Papia Poppaea (Bonn, 1882). 33 T Spagnuolo-Vigorita Casta domus. Un seminario sulla legislazione matrimoniale augustea3 (Naples, 2010). The first edition was published in 1985. 34 The exception is T Rice Holmes The Architect of the Roman Empire 27 BC-AD 14 (Oxford, 1931) at 151-152, who follows Jörs fully on the putative law of AD 4. 35 (n 5) eg, at 60-61. 36 (n 8) at 84-85. 37 Jörs (n 32) at 49-51. 38 For the enlarged scale and survival of most of the original, see Swan (n 5) at 223. 39 56 1 2: οί ίππής πολλή έν αύταΐς σπουδή τον νόμον τον περί τών μήτε γαμούντων μήτε τεκνούντων καταλυθήναι ήξίουν. Swan ((n 5) at 226) argues that μήτε τεκνούντων need not, as Jörs requires, refer to orbi, but to caelibes, who as a consequence of not being married do not have (legitimate) children, as Augustus mentions in his speech. 40 56 7 3: καί ούδέ ές ταύτα μέντοι κατήπειξα ύμας, άλλά το μέν πρώτον τρία ετη δλα προς παρασκευήν ύμΐν εδωκα, το δέ δεύτερον δύο. άλλ' ούδέν ούδ' ούτως οΰτ' άπειλών ούτε προτρέπων οΰτ' άναβαλλόμενος ούτε δεόμενός τι πεποίηκα. Jörs notes credibly that the information on the two vacationes could not have been invented and that arguments attributed to Augustus on the danger posed by emancipations and foreigners were consistent with his reign and not with Dio's own time. 41 Spagnuolo Vigorita ((n 33) at 74-75) believably identifies this law as a lex Aelia Sentia separate from that de manumissionibus, passed in the first half of AD 4, verified directly only by a papyrus from AD 138 (PMich 7 438). 43 According to Jörs ((n 32) at 55-57) this is the crucial piece of evidence: he argues that in our existing legal texts, punishment for the orbi, that is for the married men who had no children, is associated only with the lex Papia Poppaea (eg, Gaius 2 111, 286), not with the lex Iulia de maritandis ordinibus, so that the equites' protest against the punishment of orbi must refer to a law that predates the lex Papia Poppaea and which introduced a harsher penalty than the known prescription of the lex Papia Poppaea: caelebs nihil, orbus dimidium capit. 44 Jörs (n 32) at 37. Dio 54 16 7: ώς δ' ούν βρέφη τινές έγγυώμενοι τάς μέν τιμάς τών γεγαμηκότων έκαρπούντο, το δέ εργον αύτών ού παρείχοντο, προσέταξε μηδεμίαν έγγύην ίσχύειν μεθ' ήν ούδέ δυοΐν έτοΐν διελθόντων γαμήσει τις, τούτ' εστι δεκέτιν πάντως έγγυασθαι τόν γέ τι άπ' αύτής άπολαύσοντα. 45 Bauman ((n 8) at 85: "irrelevant part") also acknowledges that the demonstration is inserted awkwardly by Suetonius. 46 (n 32) at 49-50; cf Csillag (n 22) at 33. With reference to 8 BC Dio (55 5 3) narrates changes to electoral practice that may plausibly be connected with heightened measures against ambitus. He does not, however, indicate if the measures of 8 involved a law. Tacitus' plural "ambitus Iuliae leges" (Ann 15 20 3) is not conclusive. Jörs sees in the vague reference of Aulus Gellius to an edict of either Augustus or Tiberius recorded by Ateius Capito (2 24 14: esse etiam dicit Capito Ateius edictum - diuini Augusti an Tiberii Caesaris non satis commemini-, quo edicto per dierum uarias sollemnitates a trecentis sestertiis adusque duo sestertia sumptus cenarum propagatus est, ut his saltem finibus luxuriae efferuescentis aestus coerceretur) a later exacerbation of the lex Iulia sumptuaria, but Gellius makes it clear that this edict was a loosening of the restrictions of the lex, not "eine Verscharfung". 47 See PA Brunt Italian Manpower (Oxford, 1971) at 560. 48 Jörs ((n 32) at 50 n 3) rules out any idea that Augustus had treated any of the material of the lex de ambitu or sumptuaria earlier. If Jörs means actual legislation, then as long as we cannot analyse the general statement by Velleius Paterculus (2 89 3) his assertion cannot be disproved. See Bauman (n 8) at 84, Swan (n 5) at 370. 49 53 21 3: ού μέντοι και πάντα ίδιογνωμονών ένομοθέτει, άλλ' εστι μέν ά και ές τό δημόσιον προεξετίθει, όπως, αν τι μή άρέση τινά, προμαθών έπανορθώση· προετρέπετό τε γαρ πάνθ' όντινοΰν συμβουλεύειν οί, εϊ τίς τι αμεινον αύτών έπινοήσειεν, και παρρησίαν σφίσι πολλήν ενεμε, καί τινα και μετέγραφε. 50 JW Rich Cassius Dio: The Augustan Settlement (Warminster, 1990) at 154. 51 Aug 89 2: populo ...per edictum saepe fecit. 53 The only other use of emendare in Suetonius is a reference to Domitian sending agents to Alexandria to transcribe and emendare manuscripts in Alexandria (Dom 20 1), which is not the sense required here. Thesaurus Linguae Latinae V 461 24-41 provides few useful parallels of emendare used with lex, notably Tert Apol 4 6: errare in lege condenda . Lycurgi leges emendatae; Claudian 8 505-6: priscamque resumunt / canitiem leges, emendantur vetustate / acceduntque novae; CJ 6 51 1 1: lex Papia ab anterioribus principibus emendata fuit et per desuetudinem abolita. Here the main sense seems to be "revise", in the sense of "bring up to date", to suit a new situation. Swan ((n 5) at 370) insists that emendasset should be translated as "reform" rather than "amend", whereas Brunt ((n 47) at 559 n 1) notes: "I take this to mean that in Suetonius' view Augustus' law was an 'amendment' of earlier enactments." For its broader use in the Digest, see E Grupe Vocabularium iurisprudentiae Romanae vol 2 (Berlin, 1933) at 468-469, and in the Codex Justiniani, see R Mayr Vocabularium Codicis Iustiniani (Hildesheim, 1965) at 921-922. 54 See Swan (n 5) at 231. Dio confirms the legal texts. 55 (n 8) at 84. Propertius 2 7 11-12. 56 E Badian "A phantom marriage law" (1985) 129 Philologus 82-98. 57 Caes BCiv 3 21 1. See P Moreau, "Florent sub Caesare leges. Quelques remarques de technique legislative á propos des lois matrimoniales d'Auguste" (2003) 81 Revue Historique de Droit Franqais etÉtranger at 461-467. 58 See Moreau (n 57) at 468-469. 59 Suetonius uses demum frequently (x 33) and sometimes with reference to a short period, eg Aug 10 4 of two days. Where there are no other chronological indications the periods in question, where they can be ascertained, may range from a few days (Tib 51 2, Cal 9) to a few months (N2 3) or even to a year or more (Iul 23 1, Ve 2 2). Suetonius' other use ofdemum, simply to place events in a sequence may be most relevant here (Tib 61 1, Cal 38 3, Cl 5 1). 60 For Jörs it cannot mean "carry into law", because it is fundamental to his case that there was a lex (νόμος) in AD 4. It must therefore have a non-technical sense of, for example, "see through to completion" ((n 32) at 50: "Sueton spricht von einem zweiten, die lex de maritandis ordinibus verscharfenden Gesetz, und von diesem sagt er, Augustus habe es nicht durchbringen können"). Of the eight other uses of perferre in Suetonius none has even a vaguely legal sense (see AA Howard & CN Jackson Index Suetonianus (Cambridge Mass, 1922), so Jörs' view cannot be excluded on linguistic grounds, but remains improbable. 61 The termini are fixed: Augustus' return was commemorated formally on 12 Oct 19 BC (Fast Amit); a senatorial decree of 23 May 17 BC contains an explicit mention of the lex Iulia de maritandis ordinibus (CIL 6 32323 ll 57ff: qui lege de marita<andis ordinibus tenentur>). 62 Eg, Bauman (n 8) 85 n 9; Carter (n 1) at 143; Mette-Dittmann (n 22) at 162-165; and above all R Astolfi La lex Iulia et Papia4(Milan, 1996) esp at 15. Although Spagnuolo Vigorita ((n 32) at xviii-xix) rightly emphasises Jörs' achievement in his doctorate in differentiating the two laws, there are still large gaps in our knowledge. For a handy summary of the various ways the relationship between the two laws can be set out, see AM Kemezis "Augustus the ironic paradigm: Cassius Dio's portrayal of the lex Julia and lex Papia Poppaea" (2007) 61 Phoenix 274 n 14. 63 J Cujas Opera omnia vol 1 (Turin, 1758) at 319; Tituli Ulpiani 14: lex autem Papia a morte viri biennii [tribuit vacationem]. The notion is still held by Treggiari ((n 5) at 73-74) and Mette-Dittmann ((n 22) at 132). Rich ((n 50) at 193) understands three years as the maximum length of an engagement. 64 Astolfi (n 62) at 84 n 59. For the standing of Cujas, see, eg, DR Kelley Foundations of Modern Historical Scholarship: Language, Law, and History in the French Renaissance (New York, 1970) at 112-115. 65 56 7 3: άλλα τό μέν πρώτον τρία ετη δλα πρός παρασκευήν ύμίν εδωκα, τό δέ δεύτερον δύο. See (n 32) at 57-58. 66 See Real Encyclopadie X 345; Carter (n 1) at 144; Swan (n 5) at 230-231. 67 CIL 6 32323 l 57: magistri s(acris) f(aciundis) [ed]ent, s(ine) f(raude) s(ua) spectare liceat ieis qui lege de marita[andis ordinibus tenentur]. 68 Swan ((n 5) at 370) argues that not all the law's provisions were subject to the moratorium. It would be surprising if the major penalties of the law were suspended, such as the restriction on inheritance, while minor penalties were left intact. 69 56 10 1: καί ένιαυτον έκατέροις ές το τους πειθαρχήσαντάς οί έν τω χρόνφ τούτφ άναιτίους γενέσθαι προσεπέδωκε. 70 Such a notice could have appeared in the lacuna in the narrative or in relation to urban affairs in AD 9 and 10. Certainly no reference to a vacatio survives in the epitomised versions, but they also omit any mention of the one recorded by Dio at 56 10 1. 71 Treggiari (n 5) at 66-75. 72 Contra Carter (n 1) at 144. Priority in the consular fasces, attributed by Gellius (2 15 4) to the lex Iulia and Ulpian (Vat fr 197) generally confirms that priority in magisterial fasces was covered by the lex Iulia de maritandis ordinibus; advancement in terms of the leges annales was legibus cavetur according to Ulpian, hence also covered by the lex Iulia; immunity from tutela for free women with three children goes back to 18 BC (Gaius 1 145), but for freedwomen with four children only to AD 9 (Gaius 3 44; Ulp 29 3); freedmen were exempted from the operae to their patronus in 18 BC if they had two children; the married woman who produced the requisite number of children could wear the toga instita from 18 BC. 73 Spagnuolo Vigorita ((n 33) at 106) wrongly understands Suetonius' singular eques to refer to an individual protestor, but where the biographer uses the singular without an accompanying adjective Romanus it refers unequivocally to the order of equites (often in contrast with the Senate) (cf Cal 26 4, N 11 1, 12 3, Ve 9 2, Dom 4 5, 8 3). 74 (n 32) 52. So also S Demougin L 'ordre Equestre sous les Julio-Claudiens (Rome, 1988) 573. 75 (n 33) 64-66, 77. 76 At this stage Germanicus had at least two children: his sons Nero and Drusus were born in AD 6 and 8 at the latest. Unless partim . partim is rhetorical exaggeration for just two children, another child may well be indicated. Agrippina bore their sixth child Caligula in Aug AD 12; of the intervening three, the third and fourth children died infantes and the fifth Gaius survived a little longer (Cal 7). Only the third is likely to have been alive in spring AD 9, the baby Tiberius (CIL 6 888). See T Mommsen "Die Familie des Germanicus" (1878) 13 Hermes at 247-248; JW Humphrey "The three daughters of Agrippina Maior" (1979) 4 American J of Ancient History at 137 n 12; and H Lindsay "A fertile marriage: Agrippina and the chronology of her children by Germanicus" (1995) 54 Latomus at 6. Spagnuolo Vigorita ((n 33) at 61) conjectures that there may have been four living sons in the first half of AD 10, but the expression may also relate to just three sons. 77 56 17 1. See Swan (n 5) at 239-240 on the interpretation of έν τούτφ (56 11 1) 248. 78 His paraphrase "even though the law was mitigated in this way, the equites . "; cf Jörs (n 32) at 51: "trotz der Milderungen". In addition to the parallels cited by Swan (Aug 78 2, Tib 65 2 and Cl 24 1); see Iul 70. 79 (n 5) at 370. 80 Dio 54 16 7. 81 Dio 56 7 2. 82 Treggiari (n 5) at 65; R Astolfi ("Il fidanzamento nella lex Iulia et Papia" in Studi in onore di Eduardo Volterra vol 3 (Milan, 1971) esp at 682-685; Mette-Dittmann (n 22) at 163-164. 83 If the testimony of post-classical jurists is relevant, the absolute minimum age for betrothals was seven (D 23 1 14). 84 Treggiari (n 5) at 453; Sen Ben 3 16 2-4; Martial 6 7. 85 Jörs (n 32) at 38; Astolfi (n 62) at 194. 86 Eg, E Levy Der Hergang der römischen Ehescheidung (Weimar, 1925) at 49-51. 87 See M Humbert Le remariage a Rome (Milan, 1972) at 136-137. 88 A Söllner Zur Vorgeschichte und Funktion der actio rei uxoriae (Cologne, 1969) at 117. 89 Treggiari (n 5) at 454. 90 See Ann 3 25 1. That Suetonius included among the creditable works of Nero (N 10 1) a reduction in the rewards payable to delatores under the lex Papia Poppaea may suggest a degree of coolness towards that aspect of the law, but no criticism can be discerned in the Augustus.